Calling! In Gmail!. It's been rumored for a little bit, but now it's here. Merged. You can make phone calls from Gmail (without going to your GV page). And they're free to the US and Canada. How's it going to work? 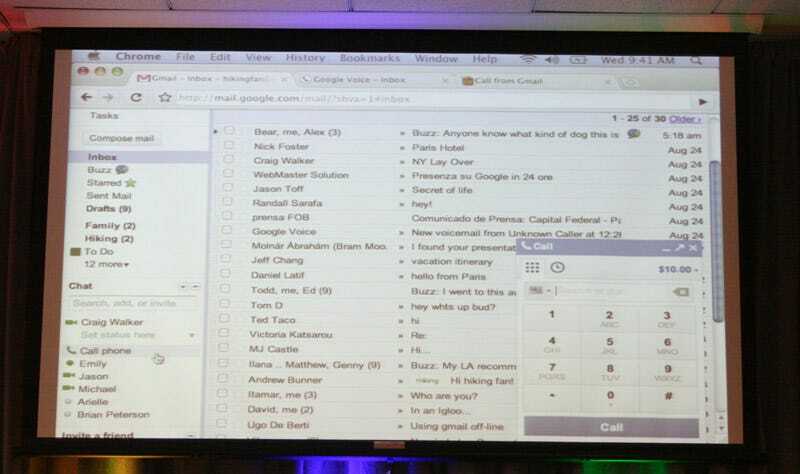 You can make calls in Gmail, and then talk directly to your computer. Google says the call quality is "really good," even just using the standard mic and speaker in the laptop you have. They claim they have really good echo cancellation—the same one they use on the video/voice chat in Gmail. You can make international calls as well ("competitive" rates, such as 2 cents a minute to call Paris). How about receiving calls? If you have a Google Voice number, it'll bring up a popup in Gmail and you can answer there. There's also a button to switch from your Gmail to your other phones on your Google Voice account, to continue your call there. The Google chat option is in your Google Voice "phones" by default, so all you have to do is check the option. Calls to US and Canada will be free. And these will be the rates internationally, to landlines. And the rates for mobile, international. Google's also going to be putting these red Google Voice phone booths in college campuses, airports and such so people can try out GV. Google says this uses the Gizmo5 tech (the SIP, client-side calling app), and where they're putting their efforts right now. So they prefer the web-side calling rather than having you download and run an app. The feature will be rolling out within the next few days. Still no update on Google Voice number porting. Or MMS. They're saying that number porting is really hard to get right, because you need to talk to a support agent to talk you through the process. Google wants you to do it yourself, automated. They want to continue to offer the free calling to US and Canada numbers, so they're hoping that the profit from the international calls will pay for the US/Canada service indefinitely. You can use this as a Gmail user without a Google Voice account, but it will call out with a consistent number—not a customized number for you. If someone calls back that number, they'll hear a message that they got a call from a person using Gmail. I just called Brian Barrett through Gmail. It already had his number in his contact list (because I had it already programmed in, while I was using Google Voice). Call went through fine, and Barrett said it sounded exciting, talking through a browser. Call quality was fine too, but that's mostly dependent on your Wi-Fi connection and the quality of microphone you have (I was using a headset).